Trying but not getting the coupon! I Love Pantene makes my hair soft and shiney!!! I love Pantene shampoo and condition…treatments condition. I Need samples please? I love me some Pantene!!!!!!!!!!!! Me Me Me I would like to try it! I got through to the Submit screen after many tries, but after I hit submit, the next screen said Service Unavailable. How do I know if they received my request ? Yay!!! I finally got through and got a confirmation!!! I just got through. Pantene posted on their FB wall that they werre having technical issues. I would like the Pantene coupon, please. It’s shampoo OR conditioner, 1 bottle. Use it and love it very much. I have “LIKED” their FB page and NO coupon tab. Will “UNLIKE” them. I would love to get one of your coupons. I keep getting a message saying it’s unavailable. I just got my coupon! I would like a free sample, please. 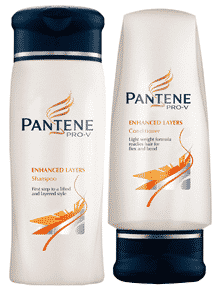 I love the way Pantene leaves my hair smelling & feeling clean! Pantene is what I always use! I could use a coupon! I got mine in THANKS!! I love their shampoo and conditioner. I tried right at 8 and it said error! Love this!! The way it fully cleans makes your hair smell soo good! even after you blow dry it! LOVE IT! Pantene is the only brand I use, it keeps my fine hair soft & less tangles. I would love a coupon please. Just received this today and do I understand that they are all gone? I got a coupon last night !! What time does the giveaway start tonight? If you get to the site and get a blank screen, wait 1-2 minutes and it’ll just pop up. I was about to give up and then it just appeared. Got mine. I am always using Patene & so is my family. It is the best! Pantene is my FAV !! IF IT’S FREE IT’S FOR ME!!! Pantene is awesome.Thanks for the hook up. I get this reply…for entering for the 1st time..I think its crap….Sorry, only one coupon request per fan! Thanks for your interest but our system shows you’ve already entered for a coupon. Keep up with us on Facebook, and we’ll let you know when our next giveaway is happening! Something I’d truly like to try.